Your life's work is not balance. It's influence. There are many sources of information on how to balance life and work, as if being paid for something automatically meant being less alive while you do it. Work involves effort that gets results, and life involves staying alive, which often involves making money, which means doing work. What you are doing at work - right now, in the job for which you earn money - is your life's work. It's the work you do with your breath and your thought and your time and your effort. It's a big part of who you are and how you are and even how you relate to friends or family. Your life's work is your work. And despite the best efforts at contracting out and delegating, you can't make more of your life to make up for the life you give to your work. I've been thinking about how to communicate value to people. Should I just be saying that if you come to one of my programs, you will get to think in really cool ways? It's true. I create experiences that open people up to new thoughts in a way that feels really good. But that doesn't tell people how I solve problems. I've noticed that we do not often talk about sadness. We talk about depression (it's a disease) sometimes about grief (there's counselling for that). We do not talk about what it's like to be sad or how sadness enriches our lives and perspectives. We do not talk about how sadness slows us down and interrupts our thought patterns and makes a change in us. I'm sad today. There are lots of reasons, good reasons. Some are old reasons, anchored to this time of year. Others are current heartaches. Some are not really my own, but they are close enough. And some are things that have not happened yet (but they will happen one day). 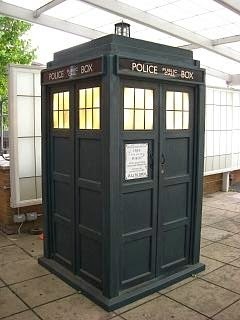 Did you know you already have your own personal TARDIS? If you are not a geek, it's possible you either haven't heard of Doctor Who or have only a vague sense of a campy sort of show that features time travel. If you've tried to sample just one episode, you might have found it quite confusing and decided to watch something else that required less research to make sense of the action. Two years ago, my son gave me Series 1 as a Christmas gift, and we watched the episodes mostly while on summer holiday. I liked it quite well, but I wasn't quite hooked. Last year, I started watching episodes on television or on the computer shortly after they aired. I liked it better, but I wasn't quite hooked. This winter, I had a cough that lasted forever and I decided I needed to take a break each day. That's when I got hooked. I have to rematch the episodes I had already seen, but I have worked my way through most of series 1 through 7.